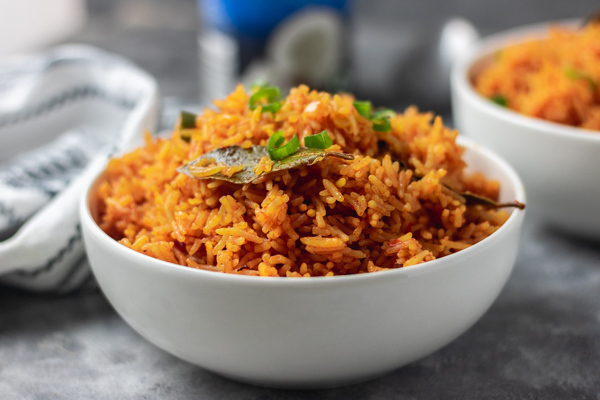 Coconut jollof rice is another great alternative way of cooking jollof rice. The subtle flavour from the coconut milk takes the whole dish to a 100. 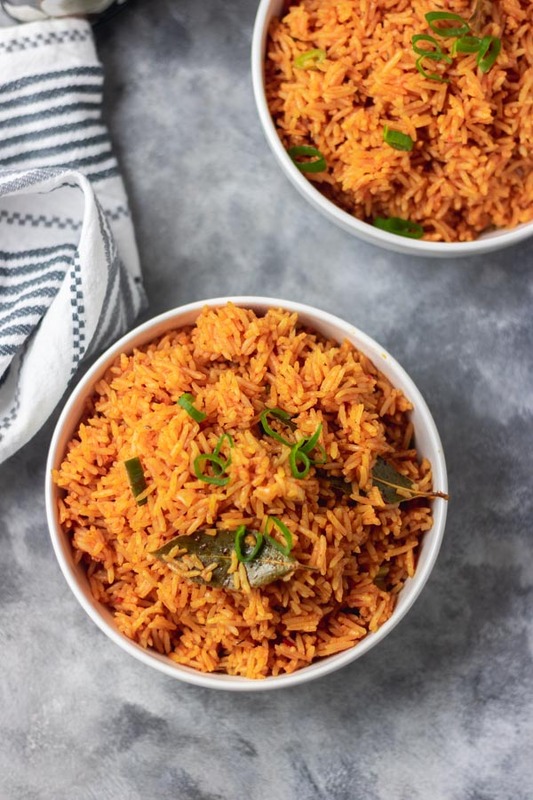 Coconut jollof rice is very easy to cook. 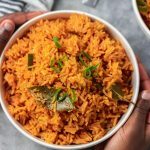 If you’ve managed to cook Jollof rice successfully then you would find this coconut jollof rice easy to make as well. I mostly eat basmati rice (golden sella) and that’s why most of the rice recipes on the blog are cooked with it. The basmati I used for this coconut jollof rice cooks exactly like long grain rice. 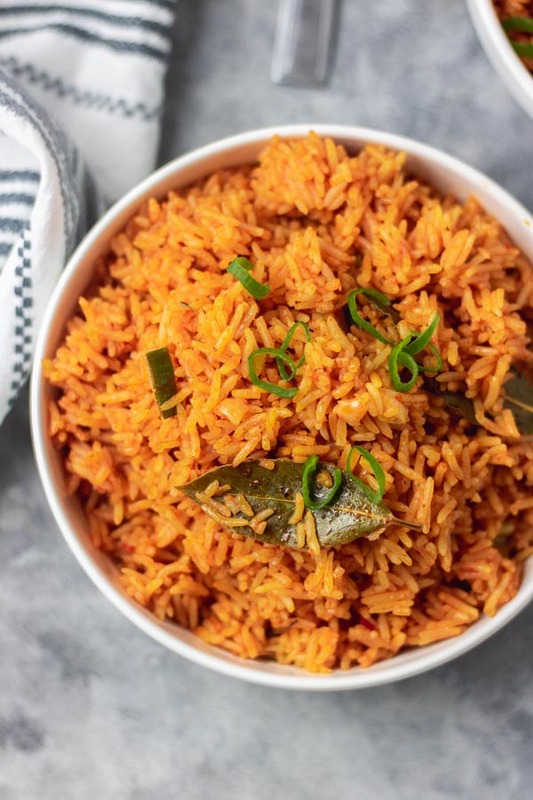 This jollof rice recipe would work with long grain rice too. Follow the same process used in this recipe if using long grain rice and Bob’s your uncle. I don’t know why I have kept this recipe up until now. It is unbelievably easy to make and absolutely delicious. 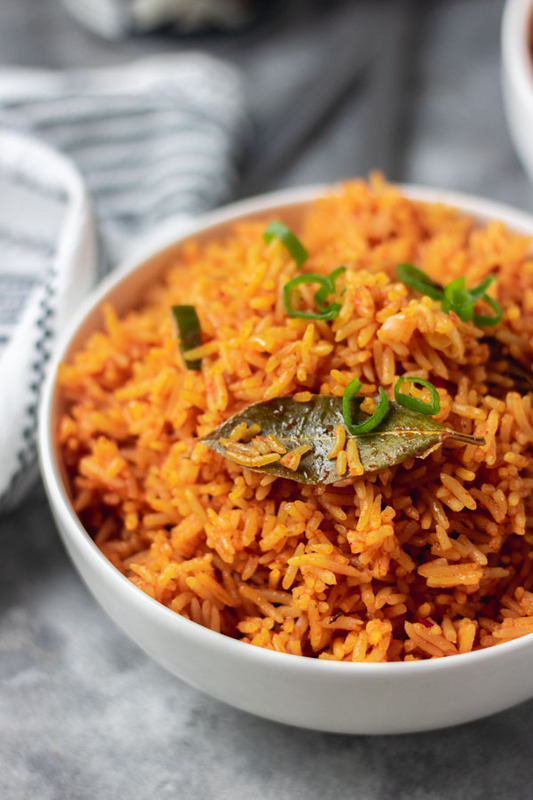 Coconut jollof rice is so delicious but if not cooked right, the other ingredients used might overpower the subtle flavour of the coconut. Start by heating vegetable oil and coconut oil on medium heat, followed by adding chopped onions, tomato paste, MAK all purpose seasoning, curry and thyme. Leave it to cook for 5 minutes then move on to add the pepper mix. Cook till oil floats on top of the sauce and sauce reduced in size. Add coconut milk, stir to combine and leave to boil for 5 minutes. Whilst you are waiting for the sauce, quickly rinse the rice with warm water. Rinse rice till water runs clear and set aside. After 5 minutes of boiling the sauce, add the washed rice, bay leaves, cover the pot with a lid and cook on low heat for 15 minutes. Check for salt, seasoning, water level and adjust accordingly. 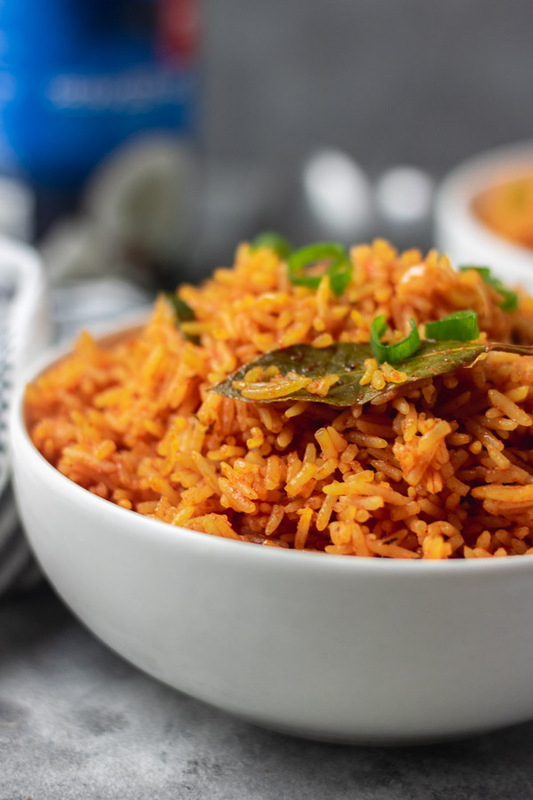 (if the rice need water, add 100ml evenly on the rice at a time and mix to combine) Jollof rice needs steam to cook rather than water. It can easily get waterlogged if care is not taken. Start by heating vegetable oil and coconut oil on medium heat, followed by adding chopped onions, curry and thyme and saute till onion become translucent. Add the tomato paste, MAK all purpose seasoning and stir to combine. Leave it to cook for 5 minutes then on low heat. Add coconut milk, stir to combine and leave to boil for 5 minutes. Whilst you are waiting for the sauce, quickly rinse the rice under warm water. Rinse rice till water runs clear and set aside. After 5 minutes of boiling the sauce, add washed rice, bay leaves, cover the pot with a lid and cook on low heat for 15 minutes. Check for salt, seasoning, water level and adjust accordingly. 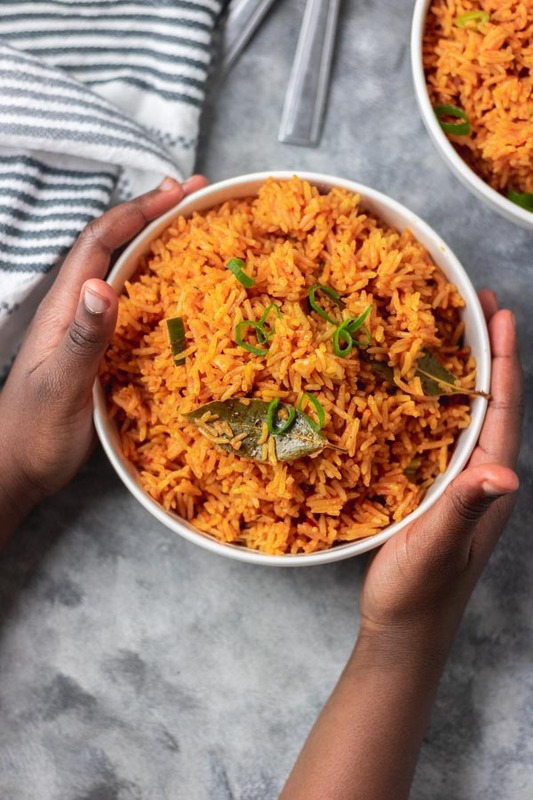 (if the rice need water because it is not soft yet, add 100ml evenly on the rice at a time and mix to combine) Jollof rice needs steam to cook rather than water. It can easily get water logged if care is not taken. 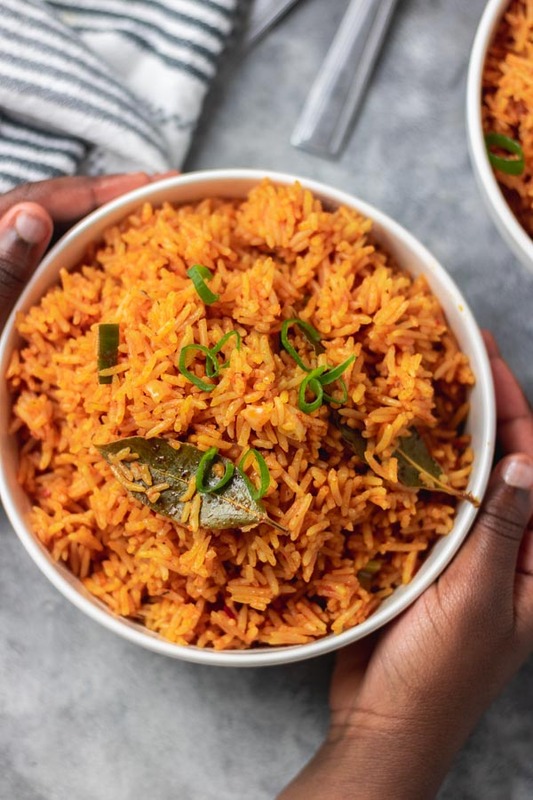 If you want the rice to be smoky like Nigerian party jollof rice, crank up the heat 5 minutes before the end of the cooking time.